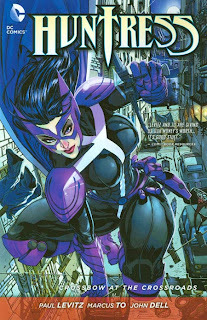 There was a great deal of fanfare when DC Comics announced that Helena Wayne-creator Paul Levitz would be introducing Huntress to the New 52 as part of a six-issue miniseries with artist Marcus To; however, the result is likely to receive mixed reactions from both new readers and longtime fans. Huntress: Crossbow at the Crossroads features a plot about human trafficking in Italy and feels as if it could have been lifted from the Liam Neeson film Taken, whose qualities, both good and bad, this series shares. Like the film, Huntress delivers constant, well-choreographed action scenes, but doesn't tell the reader much about the characters themselves. The plot is interesting enough that most readers will probably enjoy it, but anyone wanting to know more about Huntress will need to look elsewhere. By opting to write a story which revolves around human trafficking in Italy as a result of the Arab Spring, Paul Levitz immediately engages the reader by placing Helena in a real-world setting that feels relevant. The presence of Chairman Hassan, a thinly-veiled Muammar Gaddafi, as the primary villain enhances this quality. But the story is hampered by a formulaic structure; each issue is usually bookended with skirmishes between Huntress and the villains' henchmen while the middle is devoted to providing exposition in the form of two Italian reporters whom Helena befriends. As a result, the entire narrative feels as if it could have been condensed and more time could have been spent fleshing out the characters. At the same time, the action scenes are so well executed that it is easy to understand why they figure so heavily into the story. The fight sequences themselves are one of the series greatest strength's due in no small part to Marcus To's artwork. To expertly depicts the almost nonstop action sequences. Huntress practically leaps off the page as she battles thugs and corrupt policemen. Additionally, Naples and Amalfi are beautifully and accurately depicted and the level of detail is such that the reader never forgets that this story is taking place in Italy. Unfortunately, this book is held back by its lack of the characterization. While the plot is fairly interesting, there is little to no depth given to any of the characters, which is especially strange considering that in Legion of Superheroes Levitz was able to develop a massive cast of characters in as little as a few panels. The reader is given no background information regarding Helena herself; this is especially problematic as this mini-series was published in the spring of 2012 and marks Helena Wayne's first appearance in the New 52, meaning that we are unaware if her established continuity holds up or not. For most of Crossbow, the reader is unsure whether Huntress is actually Helena Wayne or Helena Bertinelli.Thus, the final "reveal" that it is in fact Helena Wayne of Earth-2 is more or less meaningless. However, there is a lot to like in what we are told about Huntress. The reader can appreciate the way in which she utilizes a host of gadgetry and tactically plans each encounter in advance rather than simply diving right in. This differentiates her from the some of her previous depictions and takes the character back to her roots as originally imagined by Levitz himself. Additionally, many of the captions show Helena's playful side; she quips about the calories in Italian sweets and admonishes gangsters for their terrible attempts at flirting. It is obvious from these instances that Levitz has a firm grasp on the character, which makes it all the more disappointing that the reader isn't given more. Her intelligence, planning, and sarcasm are traits that are all shared by several other members of the Bat-family; there is nothing that specifically ties Huntress to the plot, so she could just have easily been replaced in this series by another hero. As Batwoman: Hydrology demonstrated, a series gains a greater sense of cohesion when the hero has a personal stake in the crimes being committed, and both Huntress herself and the miniseries as a whole would have benefited from such a connection. The same lack of characterization also applies to the villains, who are mostly generic mobsters and Arab stereotypes. The antagonists utilize nearly every tactic in the villain's arsenal to draw the reader's ire -- frivolous murder, violence towards women, sacrificing the lives of subordinates in order to escape, etc. -- but fail to generate any interest. When Huntress allows the mafia boss Moretti to die in the fourth issue, it's difficult to care much because he simply isn't that compelling. It is possible that the lack of characterization for Chairman Hassan was intentional, and the readers are meant to project their animosity towards Colonel Gaddafi onto the Chairman. Even so, the best analogues those that are able to exist on their terms within the story while also referencing someone else. Chairman Hassan is not given sufficient space to be anything other than a stand-in for Muammar Gaddafi, and the miniseries suffers because of it. Huntress: Crossbow at the Crossroads is by no means a poor story, but the fine artwork is ultimately held back by the poor characterization of both the series' heroine and her antagonists. Overall, it still makes for a fairly enjoyable read, but it probably won't expand Huntress' fanbase. Given Power Girl's appearance on the final page, it seems as if the purpose of this miniseries was mainly to solicit interest in the World's Finest series that followed. Levitz is unquestionably a strong writer, and hopefully he can provide a more detailed take on Helena Wayne in his ongoing monthly series. Thanks Scott! Up next week, the Collected Editions review of Red Hood and the Outsiders: Redemption. Don't miss it!